Author Alex Haley stated that to be raised right in Mississippi meant to sit at the feet of your elders after Sunday dinner and hear stories about the ancestral past. There are precious few elder musicians still alive who were present at the birth of the blues in the Mississippi Delta in the 1930s. 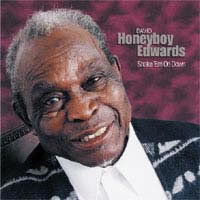 Sit and meet 84 year old David Honeyboy Edwards. If you're thinking the music recorded by this octogenarian might sound like the rehashed stories of the elderly, guess again. There's nothing stale or feeble about the blues Honeyboy plays. Whether he played jukes in the 1930s, Maxwell Street in the 1940s, Houston and Memphis in the 1950s, or travels the globe today, Honeyboy continues to play the same original, first generation country blues he's always played. The only difference is here, he shakes 'em on down using today's cutting edge, DVD recording technology. Whether you listen or view Edwards, APO captured exactly what should happen when traditional meets contemporary. Those who know Honeyboy and the musical paths he has traveled would expect nothing less. "A succession of grizzled old blues men have passed through the Blue Heaven Studio doors and all without exception have proved worthy of audiophile treatment be it on SACD or 180g LP. Edwards, a magical and quite vigorous guitarist, is another of those who has the Mississippi Delta running through their octogenarian veins...sends out an unmistakably authentic message to all those younger pretenders like the Eric Bibbs and Keb Mos who can't really hope to match these earthy and tightly grained life experiences which inform his every chord." Have Honeyboy in your listening room!!! This album is the real deal on so many levels! First of all, you're getting a blues legend who knew and traveled with Robert Johnson (!!!) and who learned from Charley Patton! Secondly, this LP was recorded perfectly. You truly feel like he's in the room with you. I had the privilege of seeing Honeyboy a couple of times in the early 2000's and this is just what he sounded like. Sometime the guitar is out of tune, but so what - the emotion coming out of him is intense. So glad he lived a full life until the age of 96. An unspoken blues legend.